The black color and the sleek design loaded with unmatched features makes the Apple iPhone 7 the smartphone that everyone dreams of owning. The rear camera captures photos at a resolution of 12 MP. It has a large f/1.8 aperture that offers excellent low light performance. It even includes a 7MP FaceTime camera for crystal clear video calling. The camera also supports RAW image format to capture images in higher quality. The phone promises a two hour extra battery life compared to its precursor iPhone 6. The myriad applications of the phone are easy to explore thanks to the responsive 4.7inch Retina Display with 3D Touch. The two impressive speakers, located at the top and bottom, provides for clear stereophonic sound. Featuring an A10 Fusion quad core processor, it offers a seamless multitasking performance. Lastly, with a sealed unibody design, the Apple iPhone 7 black is dustproof as well as waterproof, and can be submerged up to a depth of 1m for approximately 30 minutes. Don’t be afraid to flaunt your phone because Apple gives you all the more reasons to do so anywhere with its splash, water, and dust resistance design. The Apple iPhone 7 128GB can be submerged under 1m water for approximately 30 minutes. 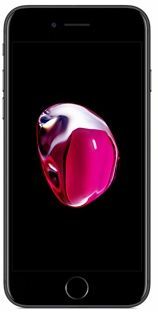 The HD retina display of the Apple iPhone 7 has a wider color gamut than before to deliver cinema standard colors and provide excellent color management. A wider color gamut offers more shades of the color spectrum that can be used to create an image. As a result, visuals displayed on the screen is a truer representation of the world. So whether you’re checking out photos or watching videos of your vacation, the colors will be so accurate, it will look as if you are there.